Growth Habit: Salsify is a former garden plant now found in many run down gardens, roadsides and waste areas. It is an erect plant which can grow up to 120cm in height. It has a well developed tap-root. Leaves are long and slender, and resemble grass leaves. Type of Plant: Salsify usually behaves as an annual in Tasmania, but in some instances it can grow for 2 to 3 years. Flowers: The flowers vary in colour from pale to deep purple. Flower heads are solitary on stalks. Fruit/Seed: Many seeds are produced over summer and autumn. 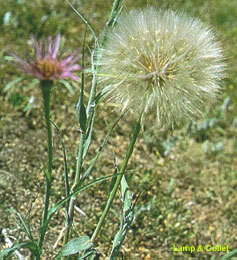 Dispersal: Seeds are equipped with the typical daisy family parachute of hairs which helps them to be dispersed by wind. Distribution: A garden escapee which may be found along roadsides, old gardens and waste areas. This plant in the past was cultivated as a vegetable. Minimal economic impact. Livestock readily grazes it. Grubbing (all year). Plants may be manually removed with a fork or similar tool.